Sales of crude oil by the Nigerian National Petroleum Corporation (NNPC) are Nigeria’s biggest income stream. The roughly 1 million barrels sold per day account for over half of public revenues. Yet each year, billions of dollars from these transactions never reach the country’s treasury, due to suboptimal sales contracts, profits lost to well-connected middlemen and questionable withholdings by NNPC. In 2014, Nigeria’s then-central bank governor Lamido Sanusi made global headlines when he told parliamentarians that USD 20 billion in oil sales earnings had gone “missing” in just 19 months. He was sacked shortly thereafter. An ensuing audit left many questions unanswered. After an upset in the presidential election the next year, a new government with a strong anticorruption stance promised reform. Seizing the moment, in August 2015 NRGI published Inside NNPC Oil Sales, the first in-depth, independent analysis of how NNPC sells oil. The 163-page report closely described the worst governance problems and made recommendations to the Nigerian government for increasing returns to the nation. The report findings were the culmination of four years of work. During that time, we reviewed voluminous records, conducted dozens of interviews, analyzed sales contracts and sent over 100 pages of questions to industry players, NNPC included. Some of the deals we pored over— especially NNPC’s complex, opaque oil-for-refined product “swap” arrangements—had never before been publicly scrutinized. Leading up to publication, we deepened our knowledge and sought change by working with many different stakeholders. Beyond researching and writing the report, NRGI personnel trained anticorruption police and journalists on oil sale governance and corruption risks, briefed officials and industry personnel from over a dozen countries, advised the Nigerian chapter of the Extractive Industries Transparency Initiative (EITI) on its oil sales reporting, supported a Nigerian government task force that probed oil revenue losses and helped Sanusi draft his “missing billions” submission to parliament. NNPC canceled all of the costliest oil sales contracts we criticized, including the swaps, three weeks after Inside NNPC Oil Sales came out, acknowledging that the contracts were skewed in favor of the companies that held them. The replacement deals’ key terms tracked with our recommendations. These moves would save Nigeria a billion dollars annually, officials claimed; our estimates indicated this was conservative. Echoing other recommendations in the report, NNPC went on to slash the number of middlemen companies with which it dealt; cut scandal-prone bilateral sales to smaller African countries; sign more sales contracts with refiners; boost the transparency of the contracting process; and release its first financial reporting data for oil sales in a decade. (Civil society groups in Nigeria have since analyzed NNPC’s monthly disclosures in detail.) Upon request, we also advised NNPC directly on transparency and redesigning the swaps. In the wake of these reforms, multiple jurisdictions began investigating some officials and companies involved in past deals for corruption. Several have already been charged in court. It is impossible to know the degree to which NRGI’s activities directly influenced these decisions, but the responses did mirror the recommendations closely and officials at the highest levels of government actively reviewed the NRGI report before making the decisions. 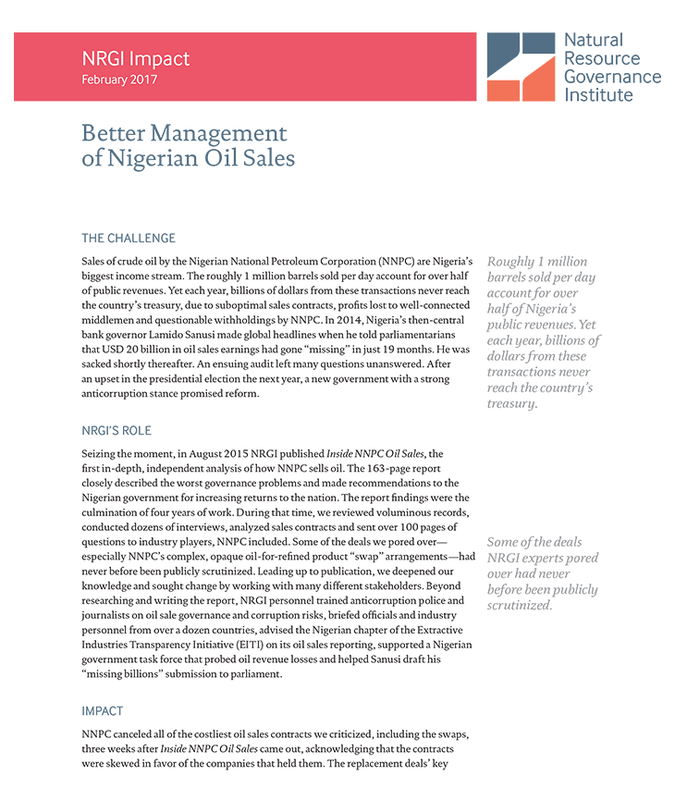 NRGI’s work on Nigerian oil sales—like the official reform process itself—is ongoing. We continue to track progress and dialogue with key stakeholders as NNPC makes more changes to its sales system. In early 2016, after we published a follow-up showing that the corporation was still retaining large amounts of oil sale earnings, its biggest withholdings shrank by nearly 50 percent over nine months. The piece drew attention from the public, the media and the highest levels of NNPC government, reinvigorating attention to these important financial flows. Two further blogs tracked the pros and cons of new oil sale contracting processes. We work with the NNPC to further improve its reporting through a global EITI process targeting oil sale transparency that NRGI helped initiate. In the coming year we intend to put out a review of NNPC’s latest swap deals and expand our research and advocacy to its fuel sale contracts, another area of where the treasury—and ultimately, Nigerian citizens—are chronically short-changed. The work in Nigeria has directly informed our campaign to push the governments of the U.K. and Switzerland to regulate greater reporting by the trading companies headquartered in their countries, an effort that made significant headway in 2016.